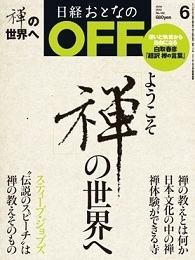 Nikkei Otona no Off magazine released an article of my translation. Nikkei Otonano Off June issue features Zen. The interesting aspect of the issue is an article about the relation between Steve Jobs and Zen culture. My translation is also released on four pages. 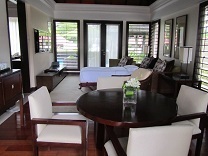 Please take a look at it! 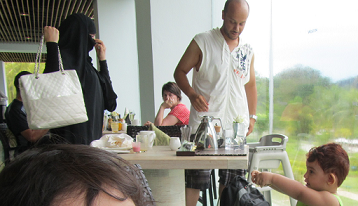 There are many tourists from Islamic countries in Malaysia. Youka made friends with a two-year-old boy, Gamau, whose mom wears a black long dress with a black scarf around her face which shows only her eyes. I guess he’s from UAE or a country around there. His father told me Gamu means the moon. He was very friendly. 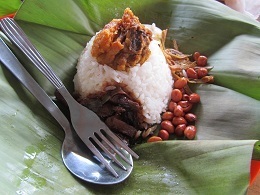 Malaysia’s original lunch food, wrapped with a banana leaf is called Nashi minya. Enjoy the rice mixed with peanuts, dried fish, miso-like paste and so on. It tastes so much better than it looks. Eating hot and spicy food, you’ll sweat and make your body cool down. A namplar-like seasoning gives it an accent. 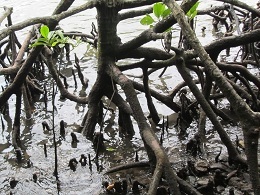 Mangrove trees grow in brackish water that is something between seawater and freshwater. 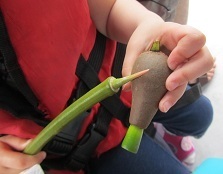 Mangrove has a long stick-like seed. If you take off the seed part, it already has a shoot inside. It falls in the water and sticks into the mud or flows a distance and puts forth a bud. �@We also planted the sprout. �ASome leaves taste salty as they release salt from their surface. 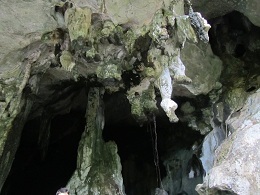 �BSome trees have a mechanism that makes only a few leaves take salt, become yellow and fall off. 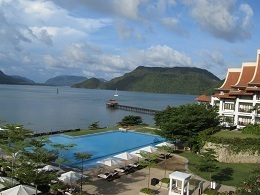 Langkawi is an archipelago of 99 islands in the Andaman Sea,. 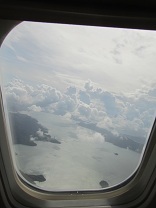 30 km off the mainland coast of northwestern Malaysia. 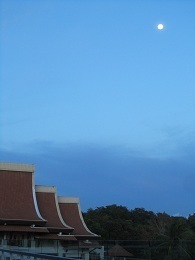 Those small islands remind me of Matsushima islands. There are many different ethnic groups such as Malay, Chinese, Indian and many travelers from Islamic countries. 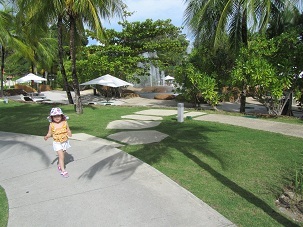 I was so excited about the first visit to Malaysia. 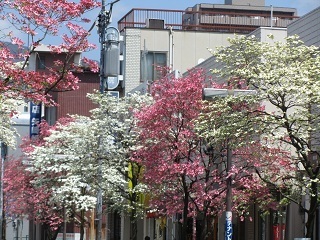 There are flowering dogwood on the roadside of a small shopping street. Pink-tinted lovely you, I hope your dreams come true. Faint color of flowering dogwood makes me feel easy and happy.